The Southern Tokoeka Kiwi is a fascinating bird to watch and study. Compared to some other species of Kiwi, the Southern Tokoeka Kiwi is relatively numerous. About 30,000 of these birds can be found on preserves near New Zealand, particularly on Stewart Island, where no common predators of the Kiwi are allowed to exist. They are also one of the only species of Kiwi known to form social groups in which to live; often, they will accompany one another within a family to hunt and stay safe. They can also be found in the high mountainous regions of Fiordland, where they make their homes within the snow. Classified among other flightless birds known as Ratites, the Kiwi shares a lineage with the Ostrich and the Emu. 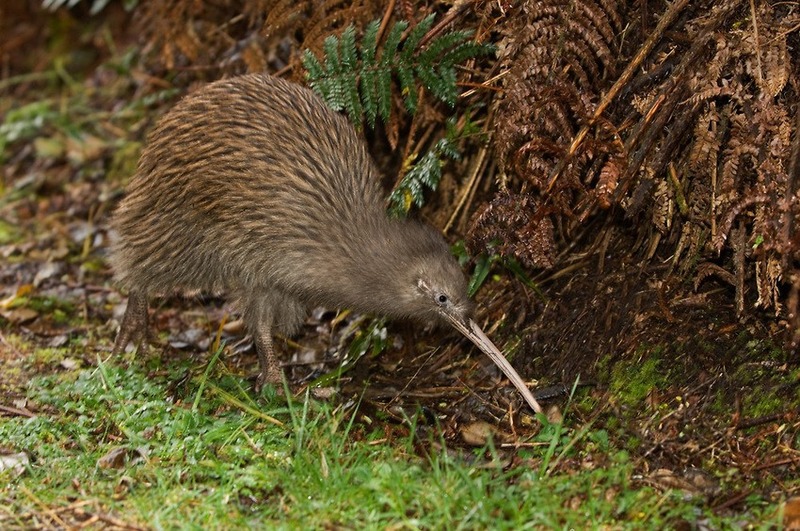 The Southern Tokoeka Kiwi has adapted to live a complete life on the forest floor. They have stout, ground dwelling bodies and are clearly meant to forage for food in the surface instead of in the air. Kiwi sleep underground in burrows and feed primarily on earthworms, though they have been known to eat an occasional berry. The Southern Tokoeka Kiwi is very protective of its home range, and will protect a large area for itself where it can safely burrow as many places as it likes. Despite the fact that the Southern Tokoeka is a relatively successful species, it is still an endangered species of bird and steps are being taken to preserve it. Several conservation groups in New Zealand are making sure these birds are preserved, keeping them in special areas where no predators, natural or otherwise, exist to threaten the Kiwi’s existence. The Southern Tokoeka Kiwi is an interesting little bird to look at. They share many physical similarities with other Kiwis. Large, stout bodies with powerful claws for digging are the order of the day; their long, distinctive beaks punctuated with nostrils for smelling. They are brown and black all over, the two colors complementing each other on the loose feathers of this flightless bird. 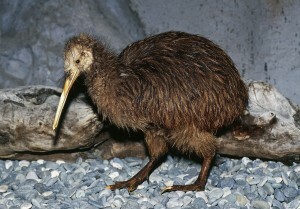 The Southern Tokoeka Kiwi is part of a larger species of birds, the Kiwi, known only to New Zealand and its surrounding islands. This species lives in Fiordland and on Stewart Island. Kiwis are an important part of New Zealand’s identity and it’s something of a crisis that these unique little birds are so in danger of becoming extinct. Hopefully, enough Kiwis can be bred in captivity and on preserves to reintroduce these wonderful little birds into the wild. The Southern Tokoeka, like its Kiwi brethren, is known for its massive egg size; the Kiwi will lay an egg nearly a quarter its body size! The egg is so big, it takes nearly three months to hatch.